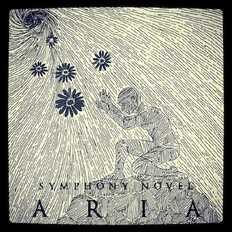 Symphony Novel | OK Listen! Symphony Novel is a progressive / instrumental / experimental / post rock project started by Rachit Sachdeva in early 2012. We are based in Mumbai , India. I lot of thought went into naming the band. We feel Symphony Novel suits us best as we are constantly thriving , making new stuff and evolving extensively. Our debut album ARIA has a total of six tracks. The songs are a unique blend of instrumental, progressive rock with classical Indian vocals textured over them. its amazing how our vocalist Gauri has stylistically sung the tracks maintaining the perfect balance between Indian classical and western music. Review by Rich Dodgin from All About The Rock , UK. The band logo is usually a stylized version of the band name itself. In other cases, as with Symphony Novel, a motif is included.This motif provides a distinct identity which compliments the simple but eloquent serif font. In keeping with the sound and lyrical content,the motif has an edgy yet mystical persona.It is designed from the mathematical symbol of infinity or rather half of the whole. As it is fashioned from the infinity symbol, the final form is that of a photograph capturing the ever evolving, mutating nature of events. The first track 'Chant' is comprised of two slokas or mantras addressing the Goddess Lakshmi and Lord Shiva respectively.This track is quite the contrast to other more darker tracks like 'Infirmity' and 'The lake'.